Hit the funny bone on Halloween night! Halloween isn't just about spooky scares and devilish costumes, there's a funny side to the season, too. Humor and Halloween go hand in hand, and if you're looking to go silly, there are many costumes out there to help make it happen. Take a look at these five funny Halloween costume ideas. One might be just right for you, and even if they aren't they may give you inspiration for something else that'll make 'em laugh on trick-or-treat night or at a Halloween party! A total role to play for the night. Credit: amazon.comBodysuits tend to always bring laughs on Halloween. While there are a few options here, this is the only one with a built-in joke! This poor puppy has sure seen better days, but the pup's problems bring out the laughs for the kids and party guests you'll be seeing. 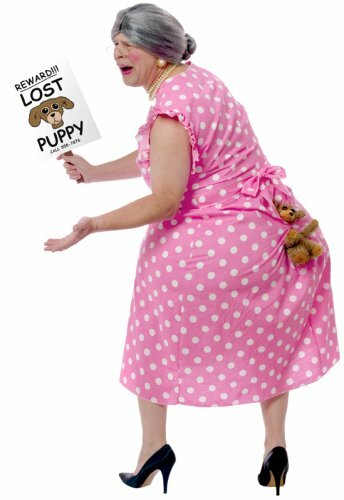 It comes with the stuffed bodysuit, along with the pink dress, the puppy (of course), and the lost puppy sign. You'll need to have to supply your own wig and other accessories, like glasses. Have fun with the make-up and wigs as they'll really help you get into the role of this costume. And a role it is--this is not costume that'll have you sitting on the sidelines. You'll be acting it up throughout the night, and people will definitely love it. Weird funny is still funny! 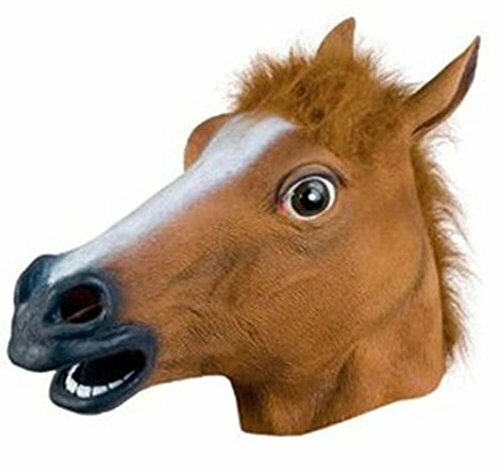 Animal masks, like the horse head mask, have become the stars of many a viral video! The Harlem Shake is one of many memes that they star in, some are super funny while others are totally weird. Either way, it's a memorable and funny way to play up Halloween night. Maybe you and your friends get a series of animal masks to create viral videos of your Halloween adventures. Or you can create funny memes with each house you trick-or-treat to, as a little community viral video project. There are lots of ways you can turn these simple animal masks into something very funny! Watch some fun ways you can horse around with animal masks. A "fan" favorite that makes 'em laugh all night. Like animal masks, the colored bodysuit look can be just weird...that is until you add an air effect into it. How about turning that bodysuit into a crazy funny super chub look? It might be the most awesome dancing costume EVER created. How does it work? The bodysuit has a fan attached to it that's powered by four AA batteries. It fills up the main bodysuit, while you have a similarly colored mask on, along with matching gloves and socks. All of course come with the costume. Not into green? That's ok, there are lots of available colors from red and pink to grey and black. It's a funny costume just walking around, but make sure to get some music on and really move to get the full funny effect. You'll totally leave an impression. The dancing is totally funny! A funny twist on the classic gorilla costume. Gorilla costumes are always pretty funny, but how about taking it a step further? Why not go a little Planet of the Apes on Halloween night and have your monkey carrying around a human in a wooden cage? It takes a standard and turns it on its head. You've of course got the gorilla suit that comes with this, along with the cage and the human legs that go in it. When worn, you are popping your head and torso out into the cage with the gorilla suit head being stuffed. You are bending a bit, so while this costume is very funny and memorable, you may not want to wear it for an entire Halloween party. Take some breaks and show off your funny costume in spurts. You'll enjoy the party more, while still being one of the highlights of the night! Roly poly fun that has a movie tie in. Credit: amazon.comA fan favorite, not only for the Ghostbusters connection (remember the giant Stay Puft monster? 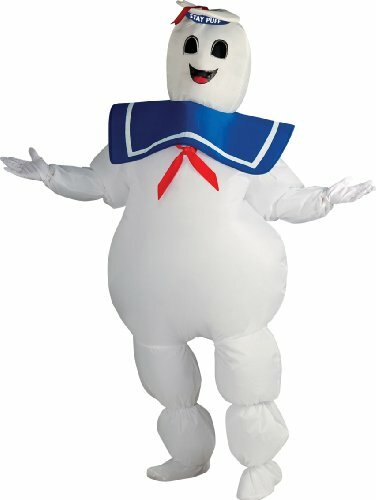 ), but also because Stay Puft is just funny to look at! But of course Ghostbusters is the main thing folks will think about, so play up the moment. Stay Puft has a certain walk, almost a silly swagger, that nearly destroyed New York City in his giant form, so find your inner muse and get the walk down! Maybe even buy a paper model of a city that you can trample on Halloween night to add to effect. 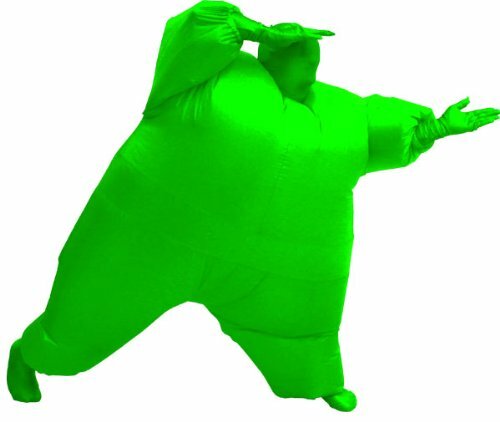 This is an inflatable jumpsuit (like the chub jumpsuit above), so it uses an attached fan to fill up the costume. And just like the chub suit, the more movement you have, the funnier this costume gets! So take your marshmallow-y swagger out on the town! Halloween Is Not Just Fun, It's Funny! Except for April Fool's Day, no other holiday allows for totally funny the way that Halloween does. Yes, it has its scares (as it should), but making the holiday humorous is just as fun. Take these funny Halloween costume ideas and run with them. If one of these works for you, then great! Take the night by storm. But no matter what, let them inspire you to find the funny for your holiday. It can make any Halloween party or trick-or-treating all the more entertaining.